drink any sugar-sweetened drinks, according to research published in Circulation, an American Heart Association journal. Heart disease is the leading cause of death in the United States. The most crucial risk factors include obesity, smoking, physical inactivity, diabetes and poor diet. Researchers, who studied 42,883 men in the Health Professionals Follow-Up Study, found that the increase persisted even after controlling for other risk factors, including smoking, physical inactivity, alcohol use and family history of heart disease. Less frequent consumption of the sweetened beverages such as twice weekly and twice monthly did not increase risk. Researchers also measured different lipids and proteins in the blood, which are indicators (biomarkers) for heart disease. These included the inflammation marker C-reactive protein (CRP), harmful lipids called triglycerides and good lipids called high-density lipoproteins (HDL). Compared to non-drinkers, those who consumed sugary beverages daily had higher triglyceride and CRP and lower HDL levels. Artificially sweetened beverages were not linked to increased risk or biomarkers for heart disease in this particular study. Beginning in January 1986 and every two years until December 2008, participants responded to questionnaires about diet and other health habits. They also provided a blood sample halfway through the survey. Follow-up was 22 years. Participants were primarily Caucasian men 40-75 years old. All were employed in a health-related profession. Health habits of the men in the study may differ from those of the general public, but findings in women from the 2009 Nurses’ Health Study were comparable. The American Heart Association recommends no more than half of discretionary calories come from added sugars . For most American men, that’s no more than 150 calories per day and 100 for most American women. Discretionary calories are those left in your “energy allowance” after consuming the recommended types and amounts of foods to meet all daily nutrient requirements. The Canadian Institutes of Health Research funded the analysis and the National Institutes of Health funded the Health Professionals Follow-Up Study. American Heart Association Sugar-sweetened drinks linked to increased risk of heart disease in men, study suggests. This article is for informational and educational purposes only; It is not intended to provide medical advice, diagnosis or treatment. A new study identified a new culprit that leads to atherosclerosis, the accumulation of fat and cholesterol that hardens into plaque and narrows arteries. The study was by conducted NYU Langone Medical Center researchers and published online by Nature Immunology in January 2012. The research explains why cholesterol-laden, coronary artery disease-causing cells (called macrophages) accumulate in artery plaques. However, once they fill up with the unhealthy form of cholesterol they get stuck in the arteries, triggering the body’s inflammatory response. 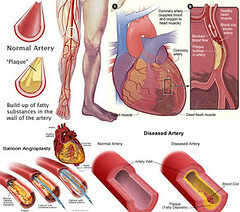 The bloated macrophages then become major components of plaque lining artery walls. Until now, the mechanism by which macrophages become trapped has remained unknown.In this new study, researchers show why macrophages remain in artery plaques leading to atherosclerosis. Netrin-1 promotes atherosclerosis by retaining macrophages in the artery wall. In fact, netrin-1 signals macrophages to stop migrating and as a result these cells accumulate within the plaque. In addition, study experiments show, genetically deleting netrin-1 can minimize atherosclerosis, reduce the level of macrophages in plaque and promote the migration of macrophages from plaques. In the study, the research scientists used a florescent tracking technique to label and monitor the movement of macrophage cells in and out of plaques. This experiment showed how macrophages were immobilized and retained in plaque by netrin-1 expression and also demonstrated macrophage emigration from plaque after the deletion of netrin-1. “Our study identifies netrin-1 as a novel target for future therapeutic intervention for the treatment of atherosclerosis and cardiovascular disease,” said Janine M. van Gils, PhD, the lead author of the study and a post-doctoral researcher in the Marc and Ruti Bell Vascular Biology and Disease Program, Leon H. Charney Division of Cardiology, Dept. of Medicine at NYU Langone Medical Center. Story Source: NYU Langone Medical Center / New York University School of Medicine. NYU Langone Medical Center / New York University School of Medicine (2012, January 9). Scientists now are reporting a significant link between eating nuts and higher levels of serotonin in the bodies of patients with metabolic syndrome (MetS) who are at high risk for heart disease. Serotonin is a substance that helps transmit nerve signals and decreases feelings of hunger, makes people feel happier and improves heart health. It took only one ounce of mixed nuts (raw unpeeled walnuts, almonds and hazelnuts) a day to produce the beneficial effects. Resaerchers from the Biomarkers & NutriMetabolomics Research Group of the University of Barcelona in collaboration with the Human Nutrition Unit of the Rovira i Virgili University explain that the rise in obesity around the world means more and more patients have metabolic syndrome. Symptoms include excess abdominal fat, high blood sugar and high blood pressure, which increase the risk of developing type 2 diabetes and heart disease. Dietary changes may help patients reduce the excess weight and become healthier. They’re recommending increased regular consumption of nuts, which are packed with healthful nutrients, such as healthy fats (unsaturated fatty acids) and antioxidants (polyphenols). Nuts have been recommended to fight the metabolic abnormalities associated with MetS. American Chemical Society (2011, November 2). Benefits of nut consumption for people with abdominal obesity, high blood sugar, high blood pressure.